The G 320 CDI and G 500 versions are equipped with an electronic 7-speed planetary automatic transmission with touch shift. The transmission has 7 forward gears and 1 reverse gear. The automatic transmission selects the shift operations that best suit the situation and driving style. Gears can be manually selected by briefly touching the gearshift lever in a transverse direction. The 7-speed planetary automatic transmission is described in the Introduction into Service Manual "Introduction of the New 7-Speed Planetary Automatic Transmission W7A 700". The 2-speed transfer case installed in the G-Class can be switched between 2 gear ratios (on-road ratio, offroad ratio). The low rotational speed of the drive shafts in off-road mode combined with a high engine torque improves the conditions for traction, particularly on unsurfaced roads. in the front axle and rear axle differentials. Depending on the driving situation, the LOW button can be pressed to switch between the operating modes LOW RANGE (off-road ratio) and HIGH RANGE (onroad ratio). When the LOW button is pressed, a red LED in the button lights up. When the LOW button is pressed again, the LED goes out and HIGH RANGE mode is activated. HIGH RANGE mode is the standard driving mode. When LOW RANGE is switched on, the engine output pattern and the shift behavior of the automatic transmission are adapted. The specially matched off-road functions of ABS, ESP?? and 4ETS are also activated. In comparison with the HIGH RANGE on-road drive mode, the gear ratio from the engine to the wheels is 1 : 2.5. The drive torque is therefore correspondingly greater. If all of the conditions for gear shifting are met, the transfer case control unit actuates the transfer case actuator motor. 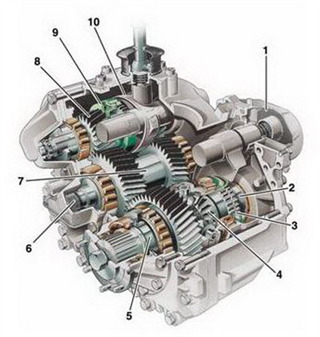 The change of transmission ratio from HIGH to LOW or LOW to HIGH takes place in the transfer case. All of the models in the new G-Class feature permanent all-wheel drive. The permanent all-wheel drive system operates with a 2-speed transfer case with reduction gear that is directly flange-mounted to the 7-speed planetary automatic transmission or 5-speed automatic transmission (G 55 AMG). 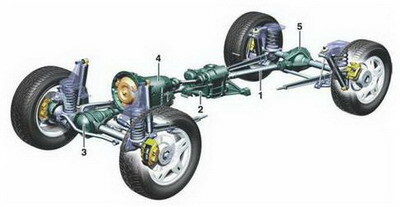 During normal driving, 2 card an shafts with universal joints transmit the drive torque equally to the front and rear axle. A bevel gear differential balances the rotational speeds. The torque is distributed between the front and rear axles of the permanent four-wheel drive in the ratio 50:50. The electronic vehicle dynamics control system ESP/4ETS is used to improve traction control and vehicle dynamics control in both on-road and off-road driving. 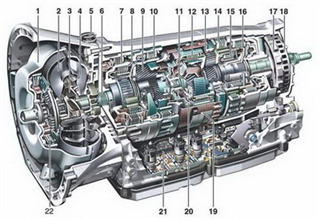 In this section we add some useful information about some Mercedes Benz 245 Automatic Transmission System and it features.